Welcome to Equi-vation, home of Equine innovation, where YOUR Passion Is Our Business. Unlike most manufacturers, we design our products from personal knowledge and experience. 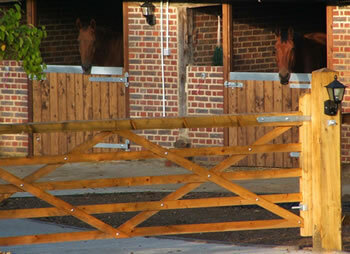 With a staff base that can boast over 130 years of equine experience, a BHS qualified II, a BHS qualified AI, and two livery yards, combined with four generations of metal working knowledge, you really wont find a better solution to your yard requirements. Equi-vation is a trading name of Bretvents ltd, A fourth generation family run business, solely owned by the Tarrant Family. Working out of converted barns, nestled at the base of the South Downs, surrounded by the horses that have shaped our companies future, inspiration comes easily. Our products are designed specifically to meet a need and overcome a problem we have found from our own experience, and once the prototypes are complete, they get handed to the liveries to test, ensuring the maximum of usability. We welcome input from customers and are always striving to improve the products, creating the best quality of products at very competitive prices. And as we make everything ourselves, by hand, we can alter and modify products to suit your requirements, and can offer full Bespoke manufacturing facilities.